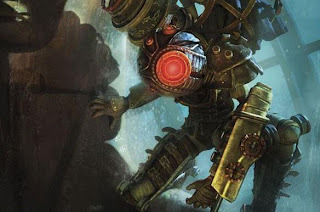 My review of BioShock 2 is up now at thephoenix.com. Games like this are fun to write about because they're really about something, and you can engage them thematically in a way that everybody will understand. Tom's point about emphasizing the "game-ness" of games hits home, but in the case of something like BioShock 2, story is such a huge part of it that I don't think you're doing readers a disservice by focusing on it. Especially in the lead-up to Heavy Rain, it's been interesting to me to see how many people instinctively resist a game that emphasize story over play. Saying games have to be one thing or another seems to me to ignore the best thing about video games, which is how broadly they can be defined. You could write a review of BioShock 2 talking only about the story. You could write a review of it talking only about the gameplay. Either one could be honest and illuminating, because the game strikes a nice balance between the two, and even uses one to strengthen the other (though not to the extent of the original). But BioShock 2 is the rare case that succeeds equally well on both counts. Most games land on one side of the divide. I think that's okay. The spectrum of games that has pure play on one end, and pure story on the other, is a long one indeed, and I don't think we should be trying to shorten it. A game with a great story may not need incredible game-ness, and history is full of examples of games with crappy stories that are still a blast to play. We can have it all! Yet it is true that for all that I thought this game succeeded as a story, I still spent an inordinate amount of time trying to shoot people in the face with rocket spears. That doesn't really come through in the review. While I loved the original Bioshock, I could never replay it. But then again, I don't replay action games. 1) Graphics -- It looked great a couple of years ago, but now it often looks ugly and blocky. 2) Story -- I found some of the story elements clumsy and difficult to follow. I remember the first game being more straightfoward and easier to understand. 3) Combat -- Good combat but ultimately not different from the first game's. For me an action game sequel has to offer something different. It might be vastly updated graphics along with some tweaks to the game systems, or widly different story telling, or just a monsterously interesting story. Bioshock 2 failed on all of these factors for me. I would say that it's fine for games to do one or the other, but the classic games do both. Bioshock, Halo, Half-life, Portal. Then there are games that had good story and weak game play: Alone in the Dark comes to mind, as well as Assassin's Creed I. Or great game play and weak story. Gears of War. I guess people consider this a class, but I sure don't. It deserves a lot of credit for the cover system, but that's about it as far as I'm concerned. A good game, but not a classic. To be fair, that's an extremely narrow range of classic games, Jim. What about earlier classics like Super Mario Bros, Space Invaders, or Rogue that attained classic status as near-pure ludic constructs? What about Planescape, which succeeded primarily because if its story and your impact on it, on the same end of the spectrum as Heavy Rain. Many would cite Shenmue as a classic game with poor game-ness and strong story. I think more often what a classic game needs in addition to succeeding as at least game or story if not both, is a strong sense of personality. Mario is a great example of this. The story is banal to the point of being insulting, but its sheer uniqueness carries the day. You instantly recognize every single character from the original game, as well as the music and sound effects. Even people who do not play games as a rule could instantly tell you what the powerups do. This is not because it succeeds as a story or because it has something to say, it's because its aesthetic is unique. Anyway, we're getting sidetracked here. Thanks for speaking up in favor of games like Heavy Rain, Bioshock etc, not necessarily as a game in itself or as an icon or as a messiah for a platform, but simply as a sign of the broadening of our canvass. I think it's cool that we're getting to a point where big games from big studios can actually say something again. Good point. The time has long since passed when video games were merely a pastime- in an era where many film actors are devoting their talents to acting for video games, can we really say that there's nothing more to video games than Pong? It's far too late for such a narrow analysis, and those who regulate their game playing to such games are missing out on works of art that often outperform anything Hollywood has to offer.